Though adverbs should be used sparingly, sometimes you do actually need them. An adverb is a word used to modify, or qualify, a verb (or verbal), an adjective, or another adverb. It usually answers one of these questions: When? Where? How? Why? Under what conditions? To what degree? Adverbs modifying adjectives or other adverbs usually intensify or limit the intensity of the word they modify. . . . . The negators not and never are classified as adverbs. A word such as cannot contains the helping verb can and the adverb not. . . .
Adverbs can modify prepositions (Helen left just before midnight), prepositional phrases (The budget is barely on target), subordinate clauses (We will try to attend, especially if you will be there), or whole sentences (Certainly Joe did not intend to insult you). Many adverbs are formed by adding –ly to adjectives (normal–normally; smooth–smoothly). But don’t assume that all words ending in –ly are adverbs or that all adverbs end in –ly. Some adjectives end in –ly (lovely, friendly) and some adverbs don’t (always, here, there). When in doubt, consult a dictionary. 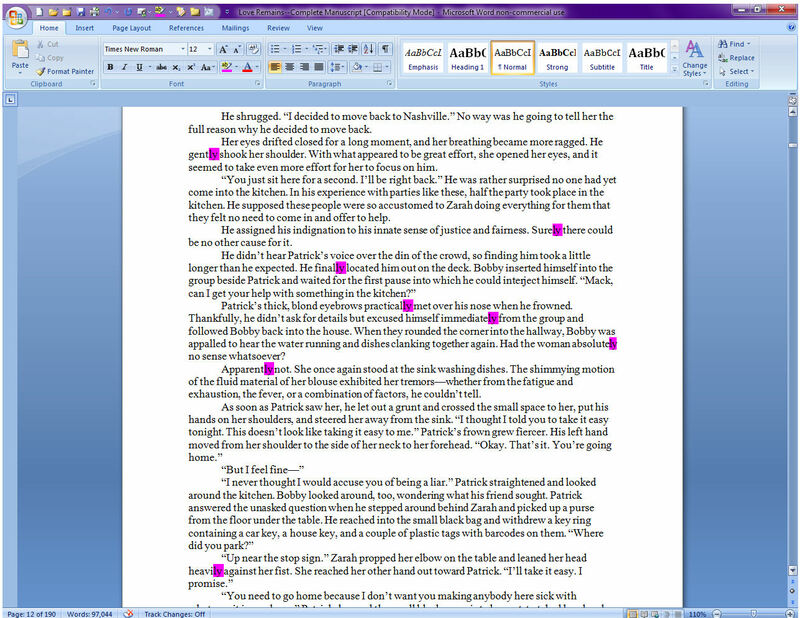 Something I have been known to do when critiquing, editing, or judging contest entries is, upon opening the document, doing a universal search for ly and highlighting every instance of it throughout the document. I’ve discussed, at length, using adverbs in embellished dialogue tags here. Kelly answered hoarsely, coughing from the powder the airbag had released. Kelly’s throat stung and scratched, and she coughed, unable to get the nasty, metallic-tasting powder from the airbag out of her windpipe. Which sentence tells and which sentence shows? This example shows how inexact adverbs can be—and how they can begin to slow down the action of the story. Have a chase scene in your story? Which would you rather use? it’s probably time to pull out the thesaurus and start choosing some more descriptive verbs and making your writing stronger! But before you go through and eliminate all of them . . . you also don’t want to replace your adverbial phrases with words that the reader isn’t going to know or understand. When you’re going through the thesaurus to find a stronger verb to use, don’t use one that you have to look up in the dictionary—and don’t use one that isn’t natural for your voice as a writer. Most can be replaced, but not all need to be. Ohhhh I love these kind of instructional posts where I can see the difference. I have to admit to being a bit attached to the -ly words. Love your examples of how strong the sentence becomes after the edit. How I wish I had read this post before that umpteenth revision in which I found, much to my chagrin, a myriad of unnecessary adverbs, including lots of narrative- and dialogue-weakening “-ly” words, just, really, etc. I couldn’t believe, when I did get out that thesaurus, just how much stronger the writing became when those extra words were removed. What we think, on the surface, is that extra words are more descriptive and emphasize the idea, but in reality, it’s like too much syrup on your pancakes. You end up with a lot left on your plate that’s wasted. Thanks, Kaye! Very interesting…..I am just a reader (not a writer), but enjoyed this!!! When I finally “got” this, it was when I finally felt there was hope of getting published some day. Growing up learning how to and encouraged to use adverbs is a hard habit to break! But what a difference it makes. I do use them once in a blue moon, but it has to earn the right to be there. I do get irked when some authors feel that they can NEVER be used. Sometimes you “just” have to! Oh Kaye, I love you. I love hearing that it is not a hard and fast rule to Kill Your Adverbs. I like the occasional one sprinkled in. I try not to use them, but sometimes it sounds better to me. Kaye…(sigh of relief) you are the bestest. Okay, since I got permission from you to use that pesky adverb I often see in books written by best seller authors, I feel much better. Seriously speaking, I just don’t fully understand the mass murder of various items from the English lexicon. Amen! Definitely tweeting this one. Like other people posting, I too learned that you had to have adverbs to describe things.